Jesus knew that the Father had given him authority over everything and that he had come from God and would return to God. So he got up from the table, took off his robe, wrapped a towel around his waist, and poured water into a basin. 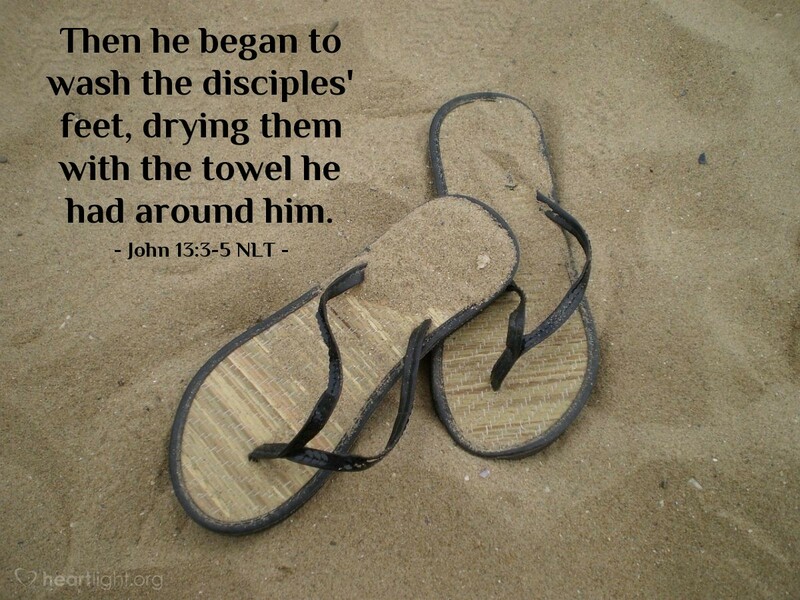 Then he began to wash the disciples' feet, drying them with the towel he had around him. Confidence in his walk with God enables Jesus to serve others and to submit his will to God sacrificially — Jesus demonstrates his confidence and submission by washing his disciples' feet, the account of which begins in today's verses. From the beginning of his ministry, God had affirmed Jesus' identity and importance: "You are my Son, whom I love; with you I am well pleased" (Mark 1:11 NIV). Knowing his identity, Jesus now serves his disciples by showing them that the power of authority is service to others, not service from them. Knowing we are children of God should motivate us to serve others as well! Father, please give me the courage and confidence to serve others sacrificially. I know you have made me your child, so please use me as your child to be a blessing to others. In Jesus' name, I pray. Amen.